Chester County, Pa., April 1, 2018 – The East Whiteland Township Volunteer Fire Association, a combination department that provides Fire, Rescue, Basic Life Support EMS, HazMat, and Fire-Police services to East Whiteland Township and Charlestown Township, has received Leadership in Energy and Environmental Design (LEED) Silver certification as established by the U.S. Green Building Council (USGBC) and verified by the Green Building Certification Institute (GBCI). The East Whiteland Township Volunteer Fire Association was founded in 1953 to assist Paoli and Malvern Fire Companies and provide additional protection for East Whiteland Township. After fifty years in their station, the growth in the service area, career, and volunteer staff prompted the search for a new facility that would be more centrally located and allow EWTVFA to better serve the growing local community. Located at the southwest corner of Conestoga Road and Mill Lane in Frazer, Pa., the 17,450 square-foot building opened in July 2015, after which the official LEED Review process began. The station was designed for maximum comfort, health, and safety, with important consideration given to history of the township and the traditional local building styles. The natural stone veneer, a key element of the exterior design, contains approximately 3,000 SF of stone and has a 3” to 6” bed depth, which contributes to the long-term performance of the building. All the stone is sourced locally, including about 25% extracted directly from the project site during excavation, which was crucial in achieving a LEED Materials and Resources Credit 5, Regional Materials. Other sustainability features include a building envelope with insulating values up to 40% higher than code requirements and an underground rainwater collection cistern. The combination of these sustainable features allowed the fire station achieve 53 points, according to the LEED-NC v2009 rating system. As a tribute, a steel beam salvaged from the tragic events at the World Trade Center on September 11, 2001 is on display directly opposite the visitor entrance. The project was featured in the 2015 Firehouse Station Design Awards in the Volunteer/Combination category. Fenza further acknowledged the diligent leadership of the Bernardon design team, the employment of many best management practices by the civil engineering firm of Chester Valley Engineers, and the excellent construction by IMC Construction, who helped leverage every project dollar to the fullest. 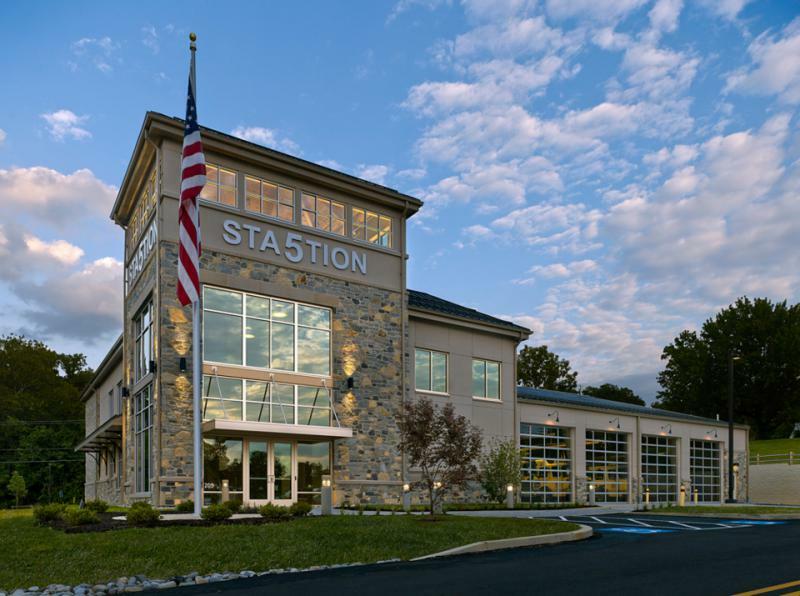 Bernardon of West Chester, PA led the project team for the new station, which also included IMC Construction (General Contractor); Bala Consulting Engineers, Inc. (Structural Engineer); McHugh Engineering Associates, Inc. (MEPFP Engineer); and Chester Valley Engineers, Inc. (Civil Engineer). The Sheward Partnership served as sustainability consultant. Would you like to know more about East Whiteland Fire Company? Take a look around our website and be sure to get in touch with us if you have any questions! Photo Courtesy of Bernardon. 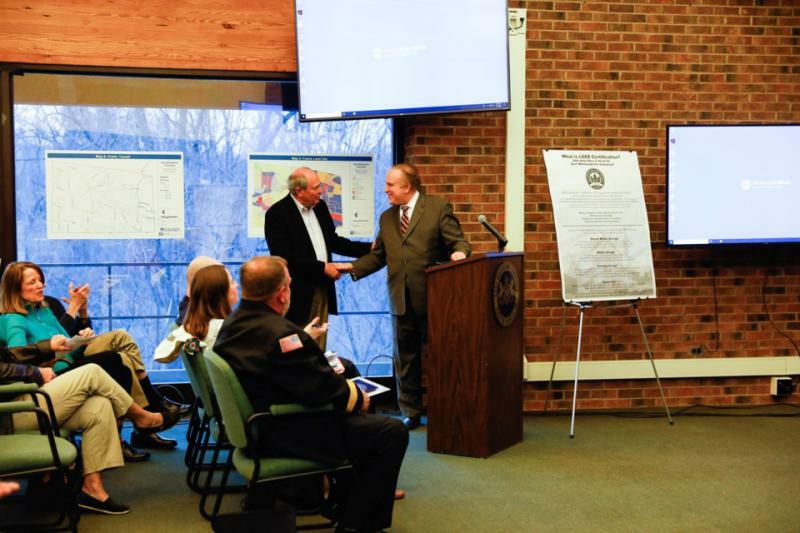 Joe Rubino (left) and Senator Andy Dinniman share their congratulations during the East Whiteland Township board of Supervisors meeting on April 11th where the LEED Certification was announced.